Wyman is back in full force for a 2014 season. Millennium Technologies and its family of companies are proud to announce a new racing partnership with Kyle Wyman, fielding an entry into the Daytona 200. Kyle Wyman will be making his Daytona 200 debut aboard the #33 KWR/Millennium Technologies Yamaha YZF-R6 during the AMA GoPro Daytona Sportbike season opener. Millennium Technologies has a long and storied history of road racing sponsorship during its 17-year tenure as the recognized leader in powersports engine machining services. A wide majority of individual racers and teams all across the board from individual privateer racers to full Factory Teams regularly incorporate a product or service from Millennium Technologies or a member of its family of companies which includes lightweight lithium-ion manufacturer Ballistic Performance Components, and Revolution Performance, manufacturer of big bore cylinder kits for Harley-Davidson motors. 2014 marks the newest chapter in Millennium Technologies’ sponsorship program with the inclusion Kyle Wyman Racing. The company will support Wyman for the Daytona 200 and will also sponsor Wyman in the XR1200 series at Daytona. After a shortened 2013 season due to a sustained injury, Wyman is back in full force for a 2014 season and looks to be making up for lost time. Kyle recently completed a very successful series of pre-season tests at Jennings GP, Auto-Club Speedway, and Chuckwalla Valley Raceway. 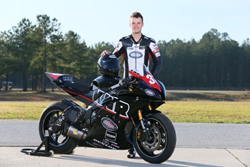 Wyman rode both the R6 and XR1200 at near lap record pace in preparation for the 2014 season opener at Daytona International Speedway on March 13th – March 15th. Fans can watch the Daytona 200 live on the internet starting at 1:00pm Saturday, March 15th. FansChoice.tv will be the official home for live streaming coverage of AMA Pro Road Racing in 2014. Complete details about FansChoice.tv will be released in the coming days. To see more of Millennium Technologies and its family of companies visit http://www.mt-llc.com. To follow Kyle throughout the 2014 racing season, visit http://www.facebook.com/kylewymanfans.